Take the worst-hitting team in the league, add two fringe players and a prospect generally considered to be not ready, and in their first game together the Mets score 15 runs. Pretty good initial return to baseball activities from Sandy Alderson! I was away all weekend and did not get to see any of Saturday's or Sunday's games. These days, you can keep checking the score on your phone, but I couldn't help but think of what my reaction would have been had I found out about the Mets' unbelievable outburst the old-fashioned way. In the early days of the Mets, they scored 19 runs in a game and the story went that when one fan was told this, his response was, "Did they win?" If I had asked someone Saturday night how the Mets did and had been told that they scored 15 runs, my response would have been, "I mean today, not for the week." 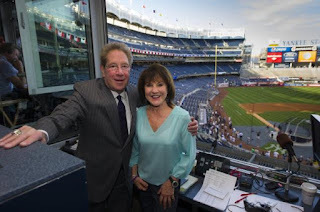 And if Squawker Lisa had called with such an update, I would have told her, yeah, right, next you'll be telling me that A-Rod homered three times today. And, in the days before box scores in your pocket, if someone had told me that not only did the Mets score 15 runs, but the starting pitcher for the Dodgers was a guy named Zach, I really would have thought I was hallucinating, Of course, it was Zach Lee pitching Saturday, not Zack Greinke. Lee was making major league debut, but considering that the Mets were already no-hit by an unheralded rookie this year (Chris Heston), it's still impressive. I wonder if the Dodgers figured they would ease Lee into the majors by letting him pitch against the hapless Mets offense. Now his next start is scheduled against Mike Trout, Albert Pujols and the Angels. Good luck! The Mets offense returned to Earth against Greinke Sunday, though they did end his shutout streak at 45 2/3 innings (on an RBI by Jacob deGrom, naturally. )And we went back to the typical story with sensational pitching by Met starters: "How many runs did deGrom give up today? Zero. Did he win? Of course not." But the Mets did win, even after Jeurys Familia blew the lead in the ninth. It was a great weekend, and I'm sorry I missed it. When was the last time I could say that?